While in previous posts I have extolled the virtues of cycling, through snow, frost or curfews, I turn my attentions this week to the German vehicle of choice, the car. Germany has millions of cars, most of them made in Germany by conveyor belts smart enough to teach at Harvard. Besides the usual dictator's favourites - Mercedes, BMW, Audi - the German automobile industry generally produces cars that are made to last and that rarely require technical attention; faultless vehicles. Germans know that other people make cars too, although they would never drive these. To be seen driving a Honda or a Toyota in Germany is like swimming across the city in puddles. Better buy a Volkswagen. Everything is designed to make your air-conditioned journey in an iron frame at high speed as pleasurable as possible in a Volkswagen. Like for many Europeans, a car is the ultimate identity captured between four doors for the young Teutonic social aspirant. Opel Adam even lets you style your own car; the front blue, the back striped - Adam Jam, Adam Glam, Adam Slam - the full individualist packet to provide the ultimate air of sophistication. Once you've got the car, drive it fast. The motorways in Germany have no speed limits and have spawned thousands of wannabe Schumachers, only driving Volkswagen. Foreign drivers are all crazy. Every German knows this. Commuters exchange tales of Neopolitans who drive while singing opera. Lorry drivers gather at the local Kneipe (pub) and smugly forebode of overseas cities filled with one-way streets, where traffic lights are decorative and double white lines are street art. Only drive a Suzuki in Germany if you want to be ridiculed for your lack of horsepower. The fact that some of the biggest car lobbies in the world - Daimler, VW and the like - are based in Germany should come as no surprise. How else would the nation share the dubious title of being a member of a triplet of sovereign entities that don't have speed limits (the Isle of Man and Nepal are the other two privileged members of this pikey-policy toting troika). 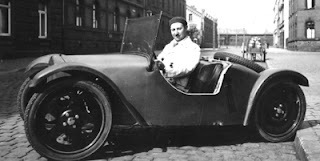 Not Hitler nor Ferdinand Porsche: Josef Ganz, inventor of the Beetle prototype. Germans see themselves as pioneers of cars: inventors of perfect machines that have been defamed by cheap imitators on sweatshop wages in countries with different alphabets. It's worth noting however that Germans were up to the same kind of commercial theft years before China dipped into the Rhine Valley. Ferdinand Porsche is credited with the first breakthrough designs for the VW Beetle. But the fact is the model had been previously developed by a German Jewish engineer, Josef Ganz. Even though Germans have many cars, there is nothing more popular than riding in someone else's. This carpooling trend is known as co-riding opportunities, or mitfahrgelegenheit. The process is simple: Get online, drag your bags to a petrol station and stumble through five hours of discussions about bio-foods in Bavarian slang driving at 265km/h. Make reference to leather seating, wooden dashboard or plated tires where appropriate. The Manufacturers Suggested Retail Price (MSRP) when the vehicle was new is listed along with the current retail price, based on standard mileage and our price analysis, which provides consumers with a close approximation of the actual cost for the vehicle. p/s : i ain't German. Nice to know the detail about the name and their stories.Its really very awesome to know.I like it so much.Nice work done on this blog, its really very informative and interesting.However if you want to check the Vin of your car so side a look on vw vin decoder.